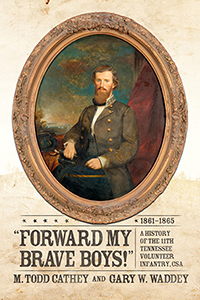 “Forward My Brave Boys!” tells the story of the 11th Tennessee Infantry, a unit comprised of ten companies of men raised from five Middle Tennessee counties in the early spring of 1861. Join these soldiers as they are transformed from raw citizens into a ferocious band of fighters, eventually becoming part of General Benjamin F. Cheatham’s hard-hitting division. First sent to the Cumberland Gap as part of the Confederate defensive strategy, they were met with Unionist activity in East Tennessee, participated in early battles in Kentucky and stymied an impending Federal invasion through the Gap. As the war progressed, they habitually found themselves in the thickest fighting at Murfreesboro, Chickamauga, and Missionary Ridge, and held the “Dead Angle” at Kennesaw Mountain. The 11th took heavy casualties assaulting the Federal lines in the desperate fighting around Atlanta, and broke the Union defenses at Franklin in some of the war’s most brutal hand-to-hand combat. Follow the survivors to Nashville for Hood’s futile attempt to regain the Tennessee capital, and then continue on to Bentonville and their final surrender at Greensboro. This book takes the reader into their camps, on the march, and onto the line of battle through first-hand accounts taken from diaries, letters, and journals. Many never-before-published photographs of the soldiers, newly created battle maps, as well as an extensive biographical roster make this a valuable resource for historians and genealogists, and a great addition to the story of the Army of Tennessee and the war in the West.